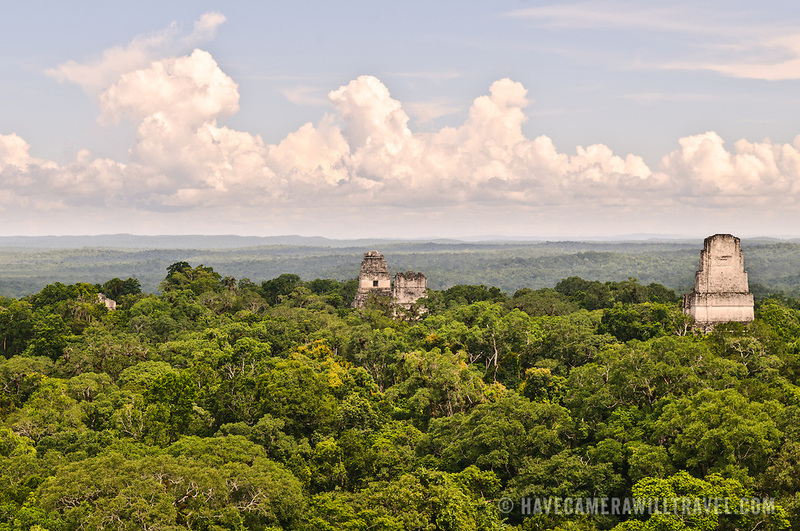 View of the Tikal Maya Ruins and the jungle canopy from the top of Temple IV, the tallest of several pyramids at the site. At very left of frame can be seen a small part of the Northern Acropolis, then, from left to right, one can see the tops of the Temple 1 (Temple of the great Jaguar), Temple 2 (Temple of the Masks), and Temple 3 (Temple of the Jaguar Priest). From this vantage point, one can watch and hear howler monkeys, spider monkeys, and many birds moving through the treetops.